The correct way to refer being " on Cape Coral"
is exactly that - IT IS NOT "in Cape Coral"
as Living "In Cape Cod"
so we as Cape Coralers should use the correct phrase too -- "On The Cape"
The International Space Station Passed directly overhead at 6:58 p.m.
the song will be recognized easily _- even thouugh it is a cover by the group "Disturbed"
does it really matter they mislead the public ? Can you afford NOT to look into this next offer ? Thats right I paid under 2 cents per gallon for my last fill up and you can too ! since then Cape Coral has become the "Land That I Dreamed Of"
But they have ignored my suggestion - go figure !! or where the parade route which the Boats will use is ? Need info on how to hook up lights ? Want to know directions to Four Freedoms Park and what the admission charge is ? Want to see some videos of past events ? with lights, costumes, elves, and whatever else their captains can think of. before they begin meandering through the canals of south Cape Coral. and food and beverages for sale. This is a unique celebration of Christmas Florida-style. The parade itself starts at 7 pm. There will be movie in the park showing "The Polar Express "
along with Santa and stage performances. I can not post it But I am sure they will have some entertainment starting around 4:00 p.m.
Who said it NEVER sn*ws On Cape Coral ? to be scooted to the Gift for Anyone who has ever said "My Feet Are Killing Me"
With the Wind Chill it will feel much colder ?????? come inland over Cape Coral and Punta Gorda. the Tree Lighting Party held Sat DEC 1 st 2018 from 3:00 to 11 p.m.
and tthe tree is located across from the McDonalds on The P aekway at approx 6:55 p.m.
and is ideal for anyone who has ever said "
My Feet are Killing Me"
"Cape Coral Boat Parade" OR "What's happening this week on Cape Coral"
Four Freedoms Parks from 4:30-7:30 P.M. The Boat Parade starts at 7:00P.M. or City Hall Parks and Recreation 239 573-3121 0r 239 573-3125 for further information. FLORIDA'S FUTURE-IT STARTS IN PARKS! "I make the call, if the weather is "TOO ADVERSE"
Will The Lead boat again be "THOR'S HAMMER", ? a 48' trawler captained by Tom Buckard. Second lead boat was the "UTOPIA", in the past - Will that be the cae this year ???? it is a 44' Viking captained by Richard Weiner. IF so there is an experienced, competent team path finding the parade, this year. Put this page in your "Favorites"
Blankets, chairs, & COOLERS ( ? ) are allowed. the Police on that too !!!!! I prefer to call it the Cape Coral "Christmas 'Boat Along' Light Parade"
then when you get to the "y"
Four Freedom Park opens at 9:00 a.m.
You can submit your pictures to me too !!! touted as the "Official Cape Coral Event Site"
You have been warned !!!!!!!!!! an appearance by the Special Snow Bird -- Santa Clause is scheduled for 6:25 p.m.
A Big "Thanks a Whole Lot"
"Thor's Hammer" @ 7 pm. - giving the boaters hoots and howls of encouragement and a light show to behold too !!!! so the correct way to refer to the area is "I live ON Cape Cape Coral"
- Or "I work ON Cape Coral"
NOT "I live IN Cape Coral"
of the whole state of Rhode Island which is Land area: 1,045 sq mi. (2,706 sq km). ( just the land ) still sell for up to $1,000,000.00 in prime locations on the river. it will benefit anyone who ever said "My Feet Are Killing Me"
Bookmark this page too !! and we can do remote repiars anywhere in the World. What is your families safety worth to you ? Before you say "Sure, when Pigs fly"
in The Cape Coral / Ft Myers area ? Now - Have you ever Said "My Feet are Killing Me"
The " Foot Eze "
I NEED STATISTICS ON WEATHER IN CAPE CORAL FL. 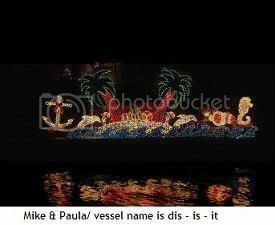 Cape Carol FLorida christmas boat light parade or the xmas boat light parade pictures are HERE. Info on sunset celebration key west style celebration monthly are here to find info on information about. Cape coral boat along 2004. Information on the cape coral boat along xmas boat light parade. Looking for Cape Coral xmas boat light parade along names of hurricanes for the year 2003 2004 2005 2002 2006 2007 2008 2009 Hurricane Charly Hurricane Katrina Charlie Charley Punta Gorda. as well as the monthly Cape Coral Yahct Club Sunset celebaration. christmas parades in Florida. A Joyce is a WOOD CONNECTION IN A CEILING, BUT WHAT IS A buckholtz ? Second Lead boat was the "Blue Dolphin" captained by Don Smith.